The latest version of Intel's Thunderbolt input/output technology can transfer data at speeds of 20Gbps, in both directions, making it twice as fast as current versions of the tech. The technology was introduced in 2011 as a data transfer rival to USB 3.0, allowing users to quickly transfer files between peripherals and computers, such as Apple's MacBook line on which it features prominently. Presenting at the National Association of Broadcasters conference in Las Vegas, the company said the new tech will also support 4K video transfer and display when it starts to appear in products next year. The advanced speeds mean that 4K video could be played back on a connected display, while simultaneously sending the file to storage devices at 20Gbps. This could eventually encourage the likes of Apple, a big Thunderbolt supporter, to consider building iMacs, MacBooks or external displays compatible with the Ultra HD resolution. It also opens the door for more recent proponents of the tech, like HP, Asus and Lenovo to do the same. 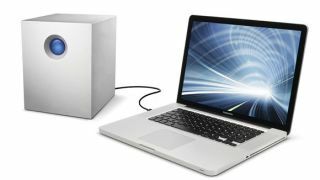 The new version of the technology will be also be compatible with current-generation Thunderbolt cables and connectors. Intel said it plans to ramp up full production in 2014. During its presentation Intel said it wasn't planning to stop at 20Gbps. By 2015, it says Thunderbolt will be running at 50Gbps, five times faster than current 10Gbps Thunderbolt connectivity.